Welcome to Show and Tell Friday! I finally have photos of my climbing Eden rose to share today! 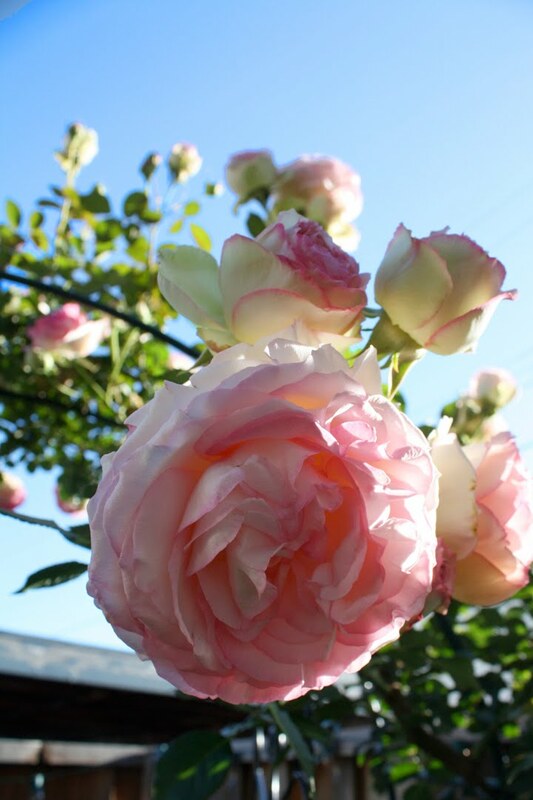 Eden is also known as "Pierre de Ronsard". I know I've said this a million times...I LOVE LOVE LOVE this rose! It's my all-time, hands-down, favorite rose!!! It takes my breath away every time I see it! I planted this about 3 years ago and it just gets better and better each year! My neighbors get the best view.... I had to go walk up their driveway to take this photo. I only have about half the blooms on my side because it doesn't face the sun. Oh man, You'd be a great neighbor! Love that rose! Thanks for having us! Gorgeous roses! Thanks for hosting! I posted a photo of some decor from my home 'My African Homeland' and the photo showed up a cartoon! I tried to take it off and start over but it wouldn't let me. Ohe well! 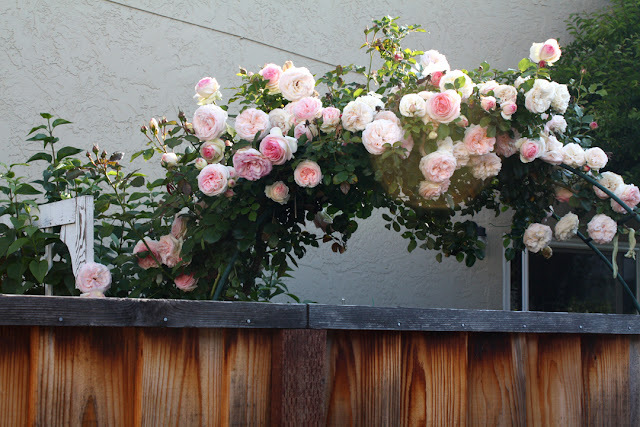 What beautiful climbing roses! I'd love to have some too! Gosh, Cindy, have you got a green thumb or what?!? Those are the prettiest Eden Roses EVER!! Thanks so much for sharing so many beautiful pics of them. Thanks also for always hostessing this fun event ~ I just linked up! Cindy, your roses are absolutely gorgeous!! Thanks for hosting the party too! I can see why it's your all-time favorite rose, Cindy! It's absolutely gorgeous. I love roses that have an old-fashion feel about them. Oh My! Thanks for sharing your beautiful roses!! Hi Cindy, I would love to be your neighbor! The roses are so gorgeous. Thank you for hosting. Beautiful roses Cindy! Thanks for hosting!! Thanks for sharing those fabulous roses! I made a note, and I am checking out my favorite nursery to get one this weekend. Thanks so much for hosting this link party. Those photos are beautiful! ! What a breath of fresh air!! Love the roses!! Oh, those are the most beautiful roses! Thanks so much for sharing the name. We're finally putting a privacy fence in next week and I can't wait to plan something beautiful for the backyard! Your roses are beautiful, I can almost smell them! Cindy! Those roses are incredible! My roses bloomed there little hearts out this year! I also forgot to tell you that my special lilacs bloomed this year... One little spray is all it gave me... but I was thrilled! Thank you so much for your post about special lilacs that bloom in Arizona and California. Gorgeous roses, Cindy! I linked up my second furniture re-do using your directions. Earlier this year I made over an old stereo cabinet -- now a buffet. And now I have a sweet little bench, thanks to you. I'm finishing up my third project of the year, and I appreciate your helpful advice and willingness to share! Olá! Estas rosas são realmente maravilhosas, uma verdadeira obra de Deus! Uma ótima sexta feira p você. Abrço, Dorath. Gorgeous roses! Thanks for hosting your party each week. So pretty! Your climbing roses are just gorgeous! I hope to put an arbor in our backyard for some climbers. Beautiful mosaic, too! 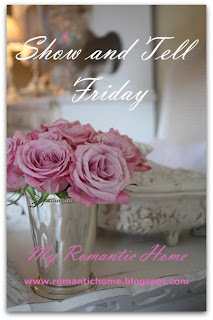 Thanks for sharing and for hosting this linkup each week. Those are beautiful! I want to get a few climbing roses to add to my new flowerbed in with the mint and lavender. I'll have to keep these in mind! 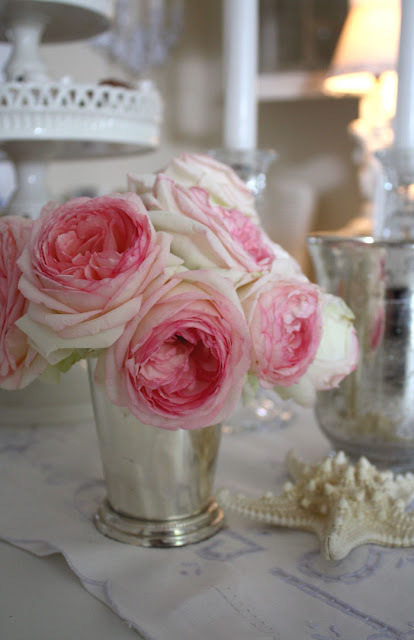 Roses and silver are great combination. They seem like a match meant to be! These are outstanding! I just have to get a rose garden started!!!! Thanks for sharing the name. Your roses takes the first price, and your photos too, so wonderful. Oh goodness, so so pretty. Thank you for hosting. I’m a follower, and this hop is found on a page on my site that lists more than 200 hops… some for each day of the week. Check under the header for the link to that page. I’ve also got a BlogFrog community that focuses on hops, carnivals, and memes. Go to http://theblogfrog.com/1504201 to visit & participate. Your roses are amazing! Absolutely gorgeous! I can smell those roses! I also have antique roses and they make me so happy every Spring when they bloom. Your roses are simply stunning, I wish I was your neighbour. Your roses are amazing! I wish I lived next door to you!! Oh what gorgeous roses!!! So dreamy, Cindy! Wishing you a happy weekend. My Eden rose is full of buds just waiting to be opened and after seeing your beautiful photos, I am getting more and more impatient! The mosaic you put together is breath-taking! I am in awe! Thank you for hosting another spectacular Show and Tell Friday! Oh my those blooms leave me breathless. Wish there were a scratch and sniff button! I just planted this rose...I have three blooms almost ready...can't wait till mine looks like yours! Your climbing Eden is BEAUTIFUL! The roses are so very very pretty. Stunning roses! Thank you again for hostessing. What lovely roses. They look like tissue paper they are so delicate. Your roses are beautiful, and boy do you know how to host a party...everyone is here. 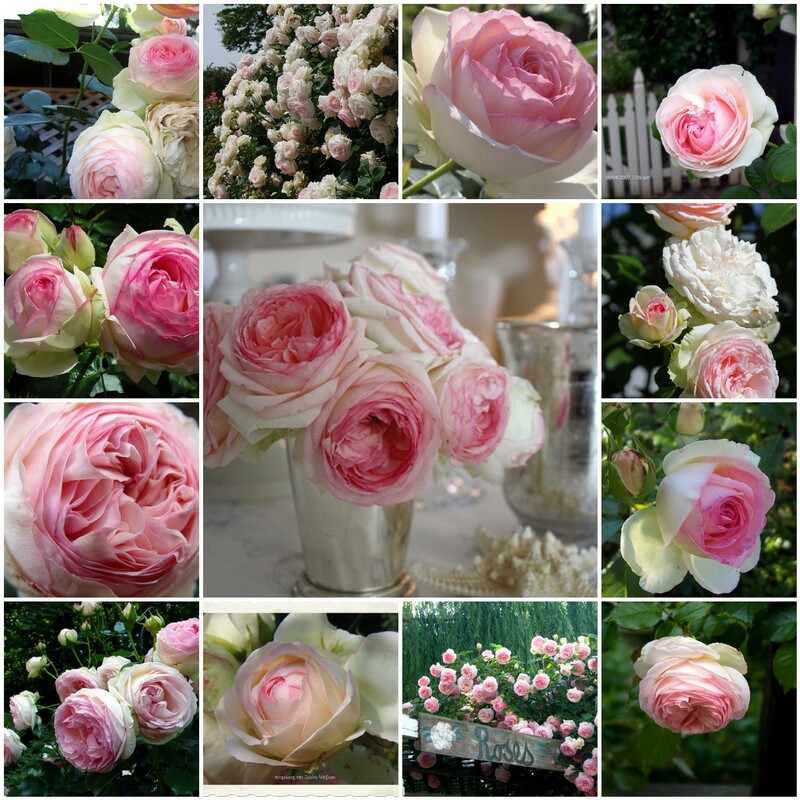 I can see why these are your favorite roses - they are stunning!! Thanks so much for sharing and for hosting. I really enjoyed the photos and the mosaic you created is so beautiful. Oh Cindy -- I wish that rose lived next door to ME. What a stunner! Gorgeous blooms, and so prolific. Fabulous, and beautifully photographed, too. Lovely! I would love to be your neighbor, I bet they smell so good. can tell us. I know he is lonely. I was just wondering. Thank you for hosting the party! Your rose is amazing. I've never tried a climbing one before, but I may have to try that one. I bet your neighbors love you! 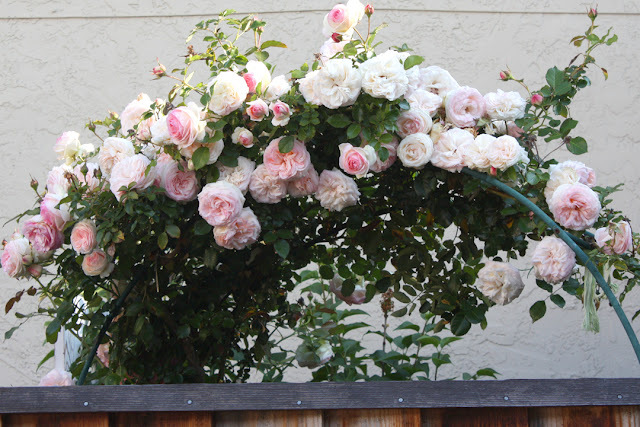 Your Eden roses are perfect for this coming summer Cindy. I truly fancy it. How did it get all the way up your porch door? Did you do it in purpose so that it will follow the arc formation? 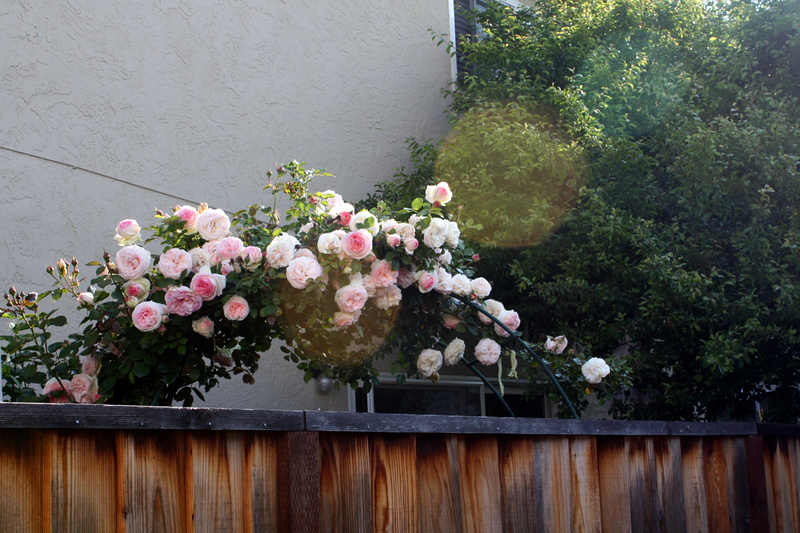 I have a climbing rose that I am so disappointed in. It doesn't do well no matter what and is covered in mildew even though i treat it. 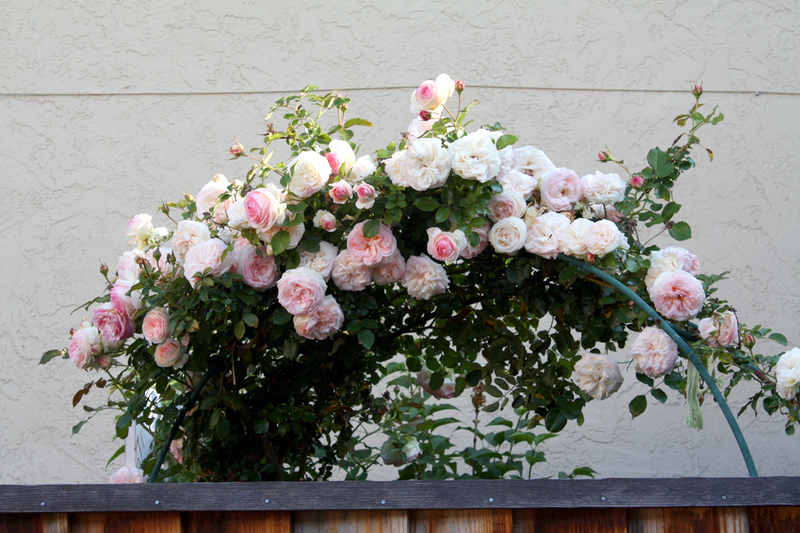 The bush rose next to it, Julia, is splendid.I think I'll take it out and get one like yours. Thanks for the lovely pictures and inspiration. Absolutely stunning. Since I read about the Eden roses on your blog a couple of years ago I knew I had to have at least two of them. I cannot find them at any of my local nurseries nor have I found them online. Do you have any suggestions. Help me if you can. Wonderful blog and nice pictures. I have got plenty of knowledge about home improvement. Beautiful roses.... I just ordered one for me. My screen saver right now is a vase full of your roses!! I'd love to be able to have my own to photograph.